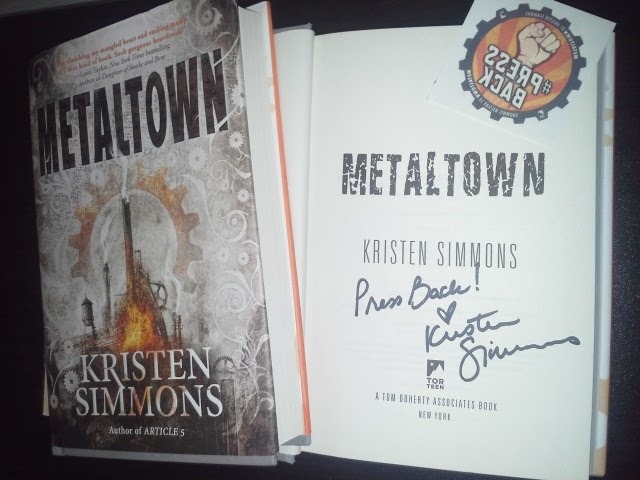 This book was such an interesting mash-up of different genres to me. 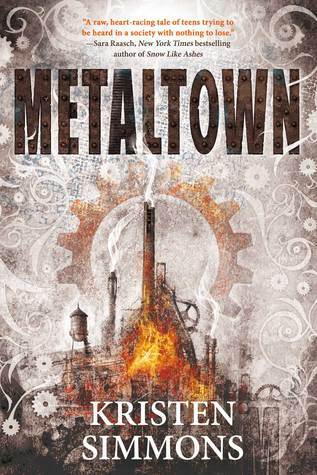 It's a dystopian story set in a completely fictional world, but at the same time it has the feel of a historical novel and addresses many present-day issues such as class struggle, environmental destruction, genetically modified organisms, and endless war. It's both plot-driven and character driven, with intricate yet easy to visualize worldbuilding. Parts of it made me laugh, parts made me cry, and all of it made me think. I suspect it's a book that will stay with me for quite a while. Metaltown has been described as Newsies meets Les Miserables, and one of the major plot points involves the young factory workers banding together to organize a "press" which is basically a worker strike. Lead by Colin, the children and teens of Metaltown band together to #PressBack for better working conditions. 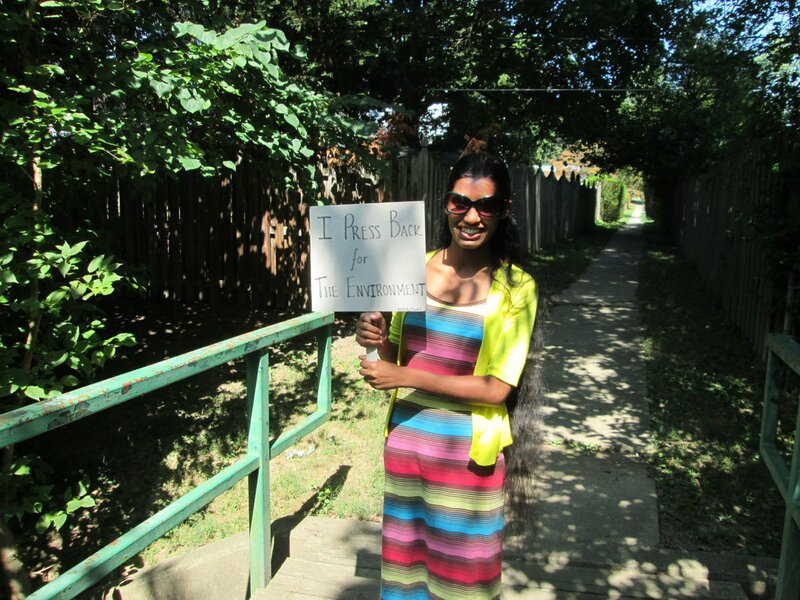 Blogger at The Eater of Books, @alyssa_susanna, presses back for the environment! to permanently remake American politics. We are witnessing a moment of unprecedented political turmoil and social activism. Over the last few years, we’ve seen the growth of the Tea Party, a twenty-first-century black freedom struggle with BlackLivesMatter, Occupy Wall Street, and the grassroots networks supporting presidential candidates in defiance of the traditional party elites. Sarah Jaffe leads readers into the heart of these movements, explaining what has made ordinary Americans become activists. As Jaffe argues, the financial crisis in 2008 was the spark, the moment that crystallized that something was wrong. For years, Jaffe crisscrossed the country, asking people what they were angry about, and what they were doing to take power back. From the successful fight for a $15 minimum wage in Seattle and New York to the halting of Shell’s Arctic drilling program, Americans are discovering the effectiveness of making good, necessary trouble. Regardless of political alignment, they are boldly challenging who wields power in this country. 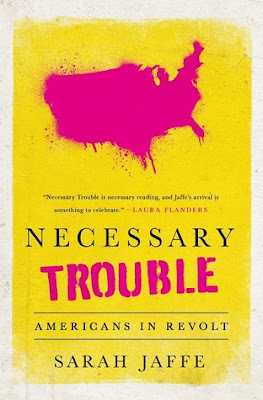 Necessary Trouble is a great book for young activists, people interested in learning more about recent movements, or even for people who just want to better understand the motivation and strategies behind today's current movements. 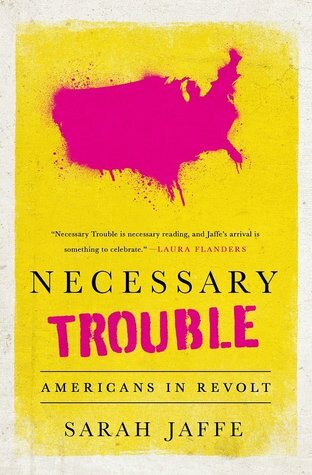 If you've ever wondered what the Tea Party was actually about, whether Occupy Wall Street resulted in any long-term positive changes, or why protestors block highways during demonstrations, then you want to read this book. If you're not used to non-fiction, you might find the sheer volume of information presented overwhelming, but the book is broken up into chapters that focus on different movements, so you can read it in smaller chunks if that helps you absorb it all. Because these are both books about standing up for what you believe in, I've created a Rafflecopter that will give you entry points for doing just that. I realize many of you are already actively engaged in pressing back, but that others might be a little overwhelmed by the world right now, unable to participate in demonstrations for a variety of reasons, and/or unsure if their individual efforts will make a difference. Never doubt your own power, even if you're not old enough to vote. Right now a group of young people aged 9 to 20 are suing the federal government over climate change. The people of Alaska persuaded their Republican senator to change her mind and oppose one of Trump's cabinet picks by calling and showing up in huge numbers. [Side note: Showing up in person, calling or emailing are more helpful than tweeting @ politicians. Calls and emails are generally counted and logged. At this point I don't think tweets are officially monitored to the same degree, but please correct me if I'm wrong.] On a local level, citizens of Seattle have persuaded their city counsel to have an official vote on removing all of the city's assets from Wells Fargo due to the bank's heavy investment in the Dakota Access Pipeline. In short, if you can find the time to support the causes you believe in, your voice will be heard by someone. You might not always win, but you'll never win if you don't try. ETA: If you want to qualify for even more giveaways, join my mailing list! It's published six to twelve times a year and almost always includes exclusive giveaways just for subscribers. Later this month I'll be sending out a newsletter with two international giveaways--one for an ARC of This is How it Happened and one for a finished copy of one of my favorite books of 2016! I've never protested for anything in my life. I've written to the governor but nothing has happened yet. I'm trying to do what I can on social media as I don't really get to go anywhere. Options for being involved definitely depend some on where you live. I would have loved to go to North Dakota to be part of the #NoDAPL protests, but the expense and logistics of getting there was too much for me so I tried to be active on social media and sent boxes of donations and made calls and wrote emails. Writing the governor is no small thing, though, especially if others are doing it too. It amazes me to hear the elected officials saying "We've gotten 10,000 calls about this or 30,000 messages about that." Those are big numbers and it's empowering to think about how each individual voice contributes to a flood of feedback like that. Seeing people all over the US march for women absolutely blew my mind when I saw the numbers. I was planning to go myself but ended up with the cedar fever (ugh) however I'm severely disappointed in myself for not going. There are more important things than a headache and sinus issues. Women are in jeopardy or losing the right to their own bodies and I was just sitting at home with the sniffles. I learned a lot that day though through my friends videos and photos they posted everywhere and its sort of amazing to see your loved ones taking charge and standing up for what they believe to be right. Don't feel bad about being sick, though. You gotta take care of yourself before you can take care of others, not in a "me first" way but in a "please affix your own oxygen mask before helping those around you" way :) I hope you're feeling better. I have never protested in my life, though I supported my daughter when she went to a Trump rally during the campaign. she wanted to be part of history and make a statement even thouhg she was too young to vote--she wanted Trump to know teens like her didn't support him in any way. I watched live feed online to make sure things were safe. That's great that your daughter is engaged in politics at a young age. I'm glad she stayed safe! I've never been a part of any protest, but I really wanted to participate in the recent women's march. Unfortunately, I live in a small town where things like that don't happen, and I had just experienced a personal issue (my business had just burned down). But I saw a lot of photos and footage and was really impressed by the turn out. And, from what I saw, it seemed like a peaceful, non-violent event. I would also be willing to participate in gay rights events but, again, I'm never in the cities where those things occur. I have gay, bisexual, and transgender family members, but I felt strongly about LGBTQ rights years before those family members were even born. Thanks for commenting, Kristy. Ugh. Still so saddened to hear about your business :( I am thinking of you and wishing you well. I have never taken part in a protest. I would encourage people to contact politicians in places such as Maryland about their anti-free speech anti-BDS legislation. I happen to know, from their remarks to me and others, that such legislation is based on a hatred of Palestinians and nothing else. Speaking up for the poor and abused is not something that should be punished.